CLEMSON, S.C. (AP) — Isaac Copeland Jr. wasn’t about to let this resume-builder slip away for Nebraska. 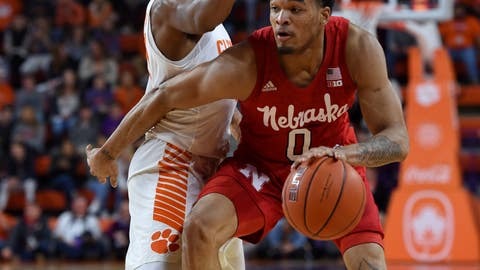 The Cornhuskers had watched Clemson cut an eight-point lead down to 66-64 in the final seconds and made sure his teammates knew it was time toughen up. “We’re winning this game. We’re winning this game,” Copeland, a senior, shouted in the huddle. “Chill out, bro, chill out,” James Palmer told his teammate, according to Nebraska coach Tim Miles. That’s just what they did when, ahead by two, they forced a turnover from Clemson’s Marcquise Reed with 9.4 seconds left. Glynn Watson Jr. followed with two foul shots seconds later to seal the win. “It’s our first real road test of the year, so passing it was really important,” Miles said. “We’re headed to high places,” he said. Nebraska: The Cornhuskers looked fast, strong and talented and they’ll have a chance to show that in Big Ten play starting this week against Illinois as the league begins its 20-game regular season. Clemson: The Tigers dropped out of this week’s Top 25 after losing the final of the Cayman Island Classic to Creighton 87-82 last week. They still looked like they were on island time as they played a step slow as Nebraska had 10 offensive rebounds and five steals. Isaac Copeland Jr. made a mark all over the place for Nebraska. He had six rebounds, three of them on the offensive glass. He made all four of his foul shots, had three of his team’s 10 assists to with a block and a steal. The Cornhuskers never gave up the lead after Copeland’s basket put them ahead 39-37 with 16:03 to go. Clemson faces St. Peter’s on Dec. 4.